It was a windy week. A sailboat heading south reported north winds of 30-40 knots. 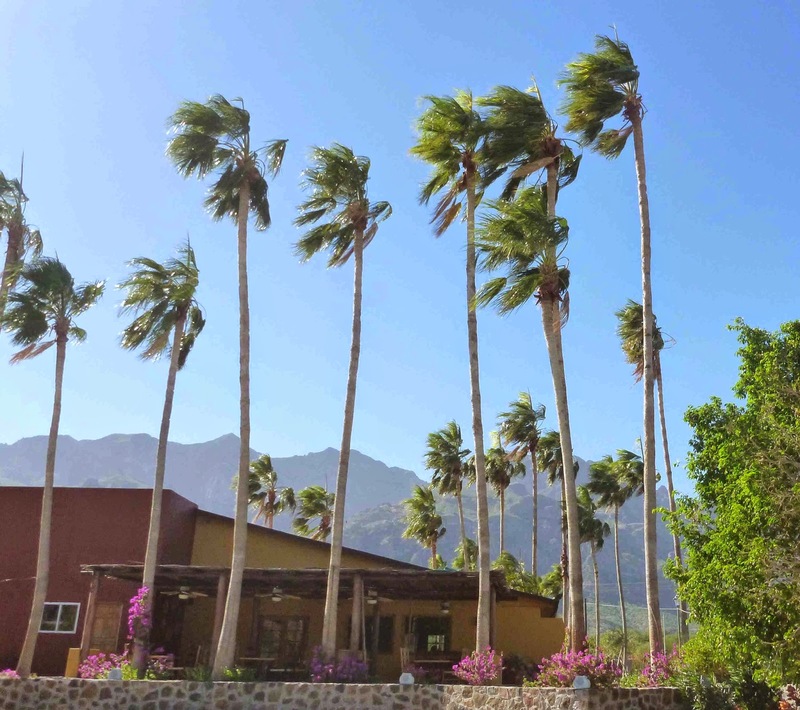 Palm trees at the hotel did a lot of lopsided yoga. Gusts of blowing dirt found us even in the pool. 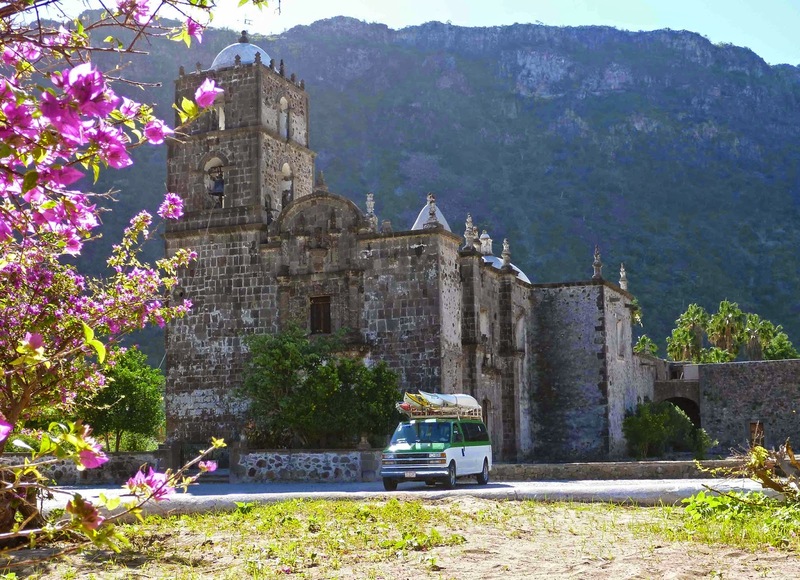 Day one, we drove up the Sierra La Giganta mountains to California’s second mission, and best preserved. San Javier. 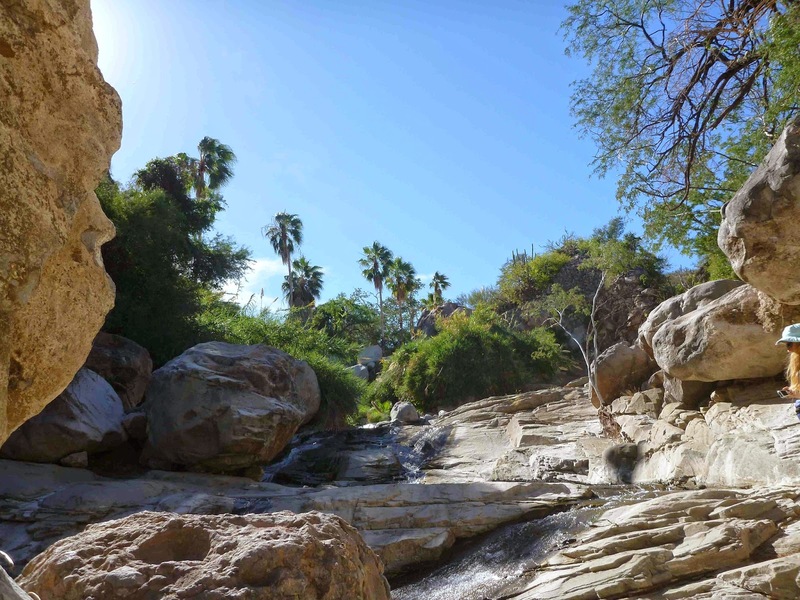 The nearby canyon, Las Parras, has flowing water, along which we hiked. Fruit trees line its banks on Francisco’s rancho, and then it flows wild through rocks and groves of palm trees. I’ve never checked in on the morning Puerto Escondido net from the shores of the Tripui Hotel pool, but I did this week. 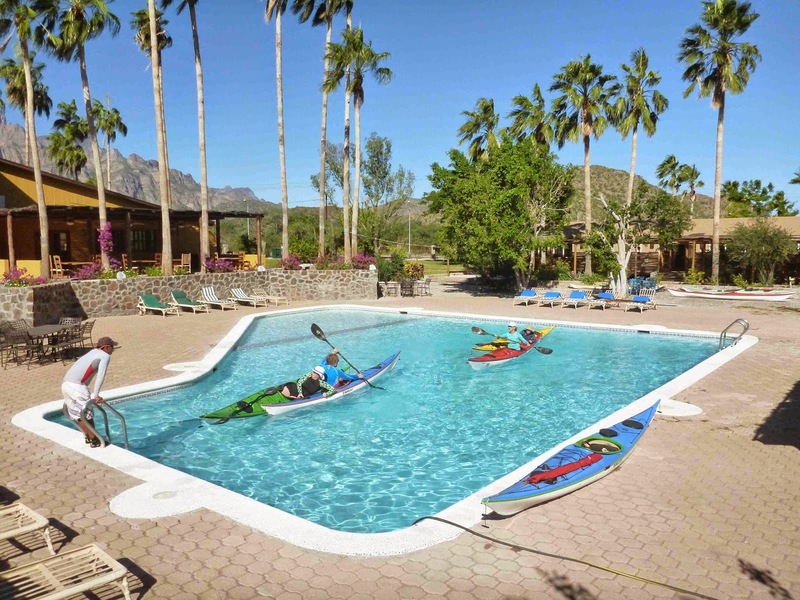 “Kayak Baja—Party of 8 at the Tripui Pool. Today we’re going for a circumnavigation.” Actually we practiced rescues, rolls, and tight maneuvering techniques. We were ready for some action on day 4. 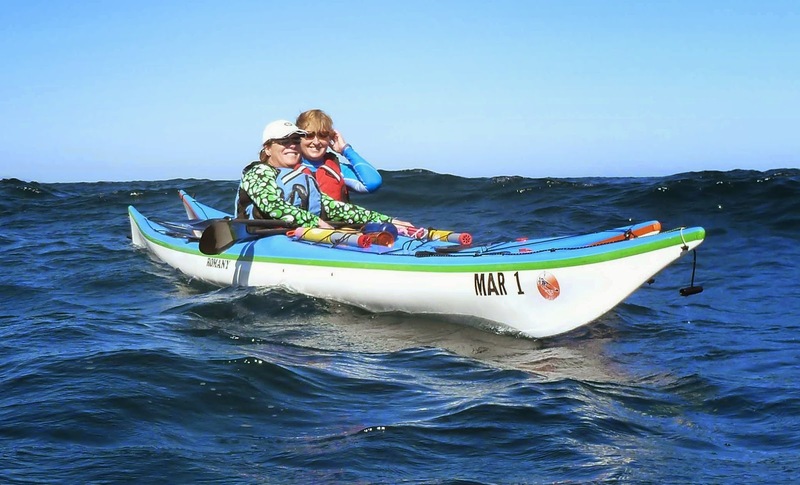 Swells of 3-4 feet rolled by Punta Coyote where we practiced maneuvering and rescues. Nervous faces opened into smiles as folks got comfortable in the waves and wind. 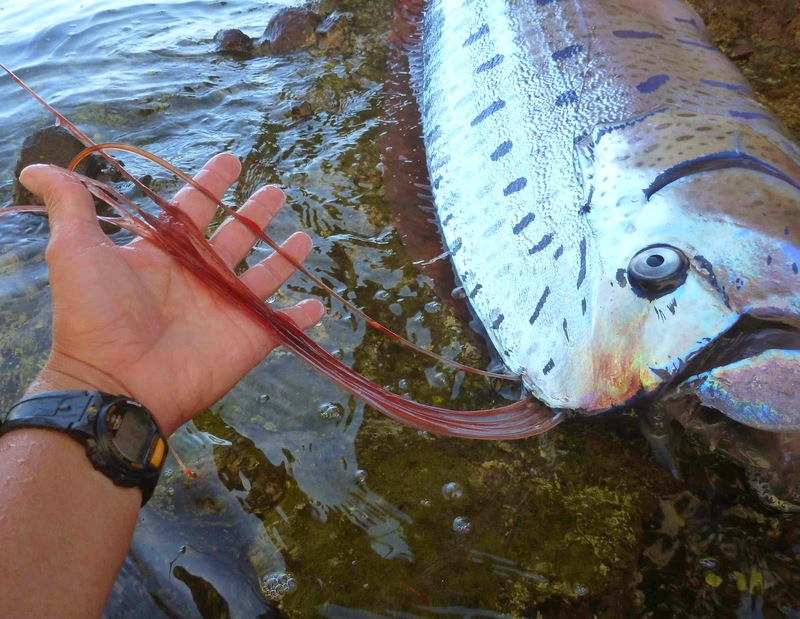 Jim spotted some strange fish and watched as 2 oarfish beached themselves on the rocks and died. Coming from 600-3000 feet deep, they are usually expiring when they’re seen near the surface. These were small, at about 8 feet long, but they can grow to 50 feet. Iridescent blue spots faded to gray as they died. Red dorsal fins waved, then rested. Gulls and turkey vultures fed. A starfish climbed aboard. Tiny red-legged hermit crabs feasted on scraps. 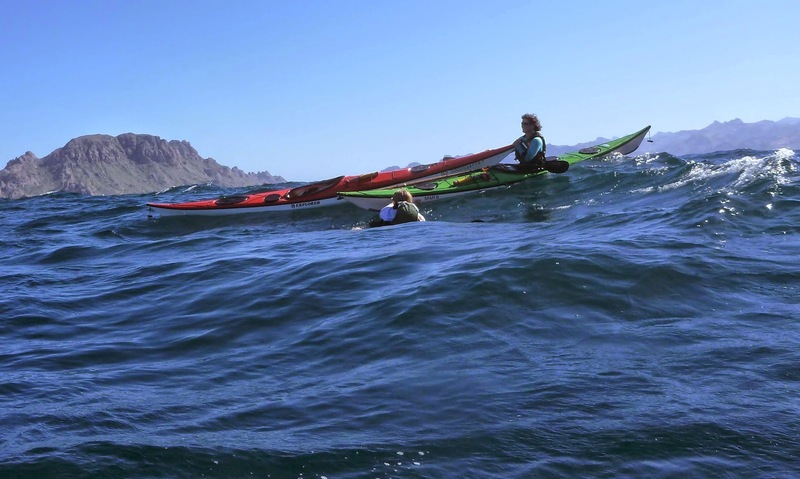 Better late than never, the wind relaxed and we crossed an undulating sea to Danzante Island for a delicious 2-day circumnavigation. 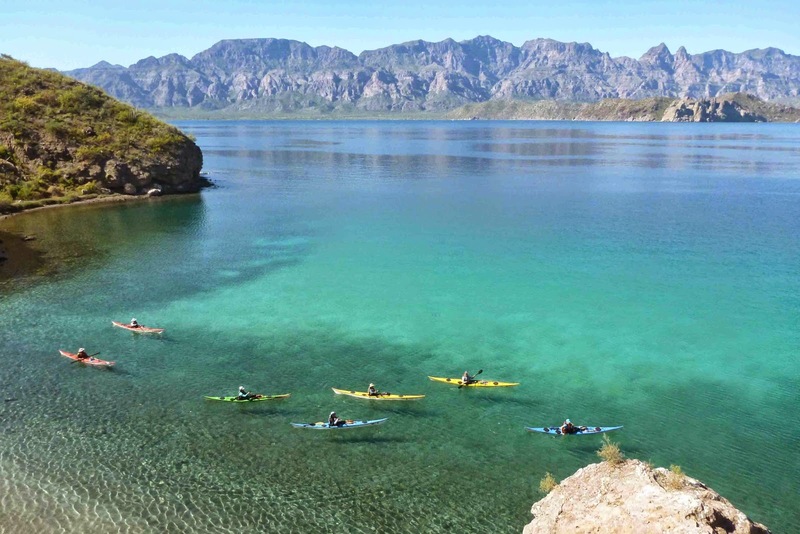 Baja trips start again in February with the Islands Builder plus Whales. Meanwhile, best of the holidays to you!